← Red cat and white duck. A beautiful dressing gown or two are essential when travelling, especially if you are going to discuss business in your hotel room. Always read the fine prints before signing any contract: you could be giving away your best selling novel’s film rights. In this episode Jessica flies to Los Angeles, trying to stop the production of a truly awful-sounding film which is loosely based on her best-selling novel “The corpse danced at midnight”. When she finds out about the movie, Jessica is at home, writing. She is wearing a cable-knit cardigan with a shawl collar over one of her usual blue shirts and a simple pair of jeans. I really like how both her outfit and her house decor convey this lovely feeling of coziness and warmth. On top of (her husband’s ?) blue shirt, Jessica wears a cardigan in a soft shade of brown, similar to this beautiful hand-knit sweater jacket by Etsy designer Pilland, or this lovely vintage sweater by Etsy seller OldAndUsed. Slouch jeans are easy to find, but I picked this pair by F&F, or this one on Ebay. As you can see, I also had a bit of a field trip in looking for vintage pieces echoing the objects scattered around her lovely kitchen, as in these frames there are plenty of them, all pretty much in plain sight. (Click on the photo if you wish to enlarge it). First of all, according to the Internet Jessica uses a Royal Magic Margin, which I think is actually quite a lovely name for a typewriter. I found two great vintage options, one on Ebay and one on Etsy by seller PoetryOfObjects. On the table, the oil/vinegar set is very similar to this one by Etsy seller Laura’sLastDitch. Actually, if you look closely, the oil bottle is identical. On the wall behind Jessica, we can see a heart-shaped copper mould, like this one by Etsy seller BinkyLoveCat. I remember my mum had some on her kitchen’s walls too! I also found a pretty vintage spice rack by Etsy seller ArcadianaHodgePodge. We can also see a striped flower vase, which has a similar vibe to this beautiful vintage one by Etsy seller RecyclingHistory. Other wall decorations are a lovely wooden wall clock, similar to this one by Etsy seller YouPicBig, and a framed portrait of a man: even though I can’t identify him, this beautiful framed original print of poet laureate Lord Alfred Tennyson, available by Etsy seller PrimrosePrint would add a similar charming vibe to your wall. I grew up with a grey telephone exactly like Jessica’s. Probably it is still at my brother’s house somewhere! You can buy one here, by Etsy seller wwVintage. Speaking of technology, this pretty vintage 1980s television by Etsy seller Dotto is not too different from the one Jessica owns. Finally, on the stove is a beautiful tea kettle, similar to this one by Etsy seller LeFrenchShop, a matching pan, similar to this one by Etsy seller iasVintage and an aluminium coffee maker similar to this one by Etsy seller Histoires. Still speaking of cozy, here are the night gowns that Jessica wears in this episode. 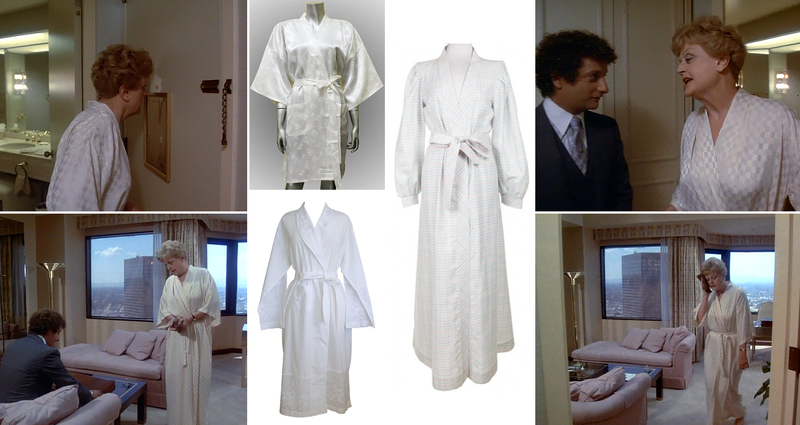 I found a few beautiful white dressing gown that have a similar vibe, such as this silk robe by Etsy seller Thaichill, this vintage Pierre Cardin robe available at Rokit or this cotton robe available on Amazon. 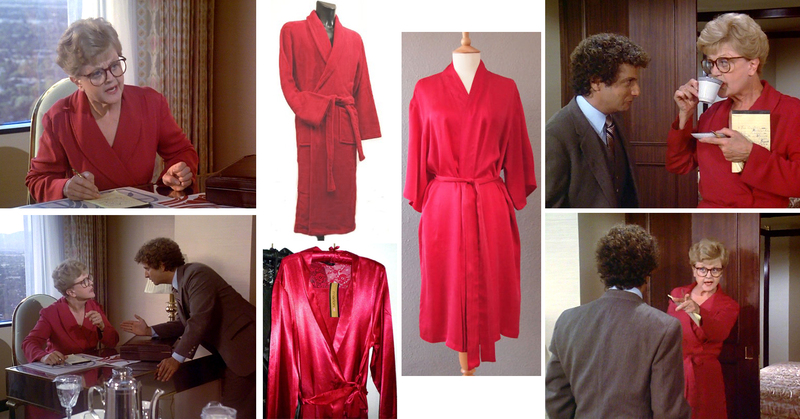 And for her beautiful red dressing gown I found this silk one by Etsy seller IdiosyncraticThings or this satin one and microfibre one, both on Amazon. At the end of the episode, Jessica is invited to a small gathering. She looks beautiful, dressing in brown and grey with a long pearl necklace (already discussed in this post). Jessica wears a grey pencil skirt, like this simple one available at M&S or this very elegant one, now on sale at Austin Reed. Her tan brown boatneck top is very pretty and I found something similar in this silk blouse, on sale at The Outnet, and this vintage blouse by Etsy seller TheLostCloset. Last but not least, here is a set of stunning vintage Champagne glasses just like the ones Jessica and her party are using, available at Etsy shop SaltAndGinger. 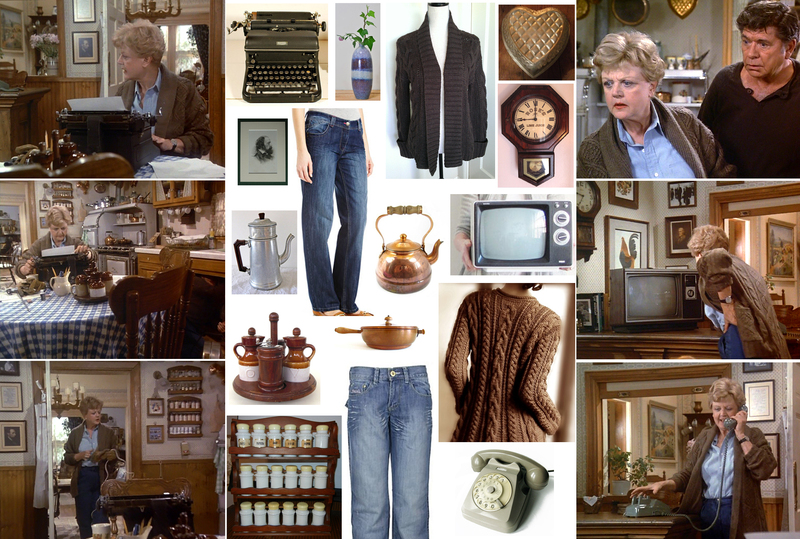 This entry was posted in Episode 04, Series 1 and tagged cozy, etsy, fashion, home decor, housewares, jessica fletcher, murder she wrote, outfit, vintage. Bookmark the permalink. FABULOUS! You are amazing, you’ve taken all of the hard work out of shopping! Aw thank you so much! I am so glad you like it! I love it! Thanks for including my vintage oil and vinegar set! oh my goodness Laura what RESEARCH. I am completely impressed, what a killer idea. Thank you so much for making this blog for all Jessica. B Fletcher/Murder She Wrote fans! I <3 Jessica's style and even have a satchel bag because of her! Aw, thank you very very much for leaving such lovely comment!! I love Jessica Fletcher too and I am so glad you like my blog! LOVE…LOVE…LOVE This post!!! Great Job! Now is that not Robert Blake of the Little Rascals & Barrett Crime show in one frame and Ron Palillo, aka Arnold Horshack on the 1970s TV series Welcome Back, Kotter,?! Thank you so much!! Wow, very well spotted, I had no idea who these actors were, I had to google them!! I ADORE Jessica Fletcher. I’ve been introducing my kids to the TV shows I watched when I was younger….going to have to add this one to the ever-growing list. What a great post! I remember how I used to watch this series every Saturday on re-run! Love the idea and execution of this post! I love Jessica!!!!! Someone thought to made a web site with all the Mrs Fletcher’s secrets at last!!!!! Wonderful wonderful wonderful site <3 ! Has anyone some info about those blue vintage tea cups and also about the sweater with the drawing of homes and the words "home sweet home"? This is amazing! You’ve made my dreams come true by making this blog. 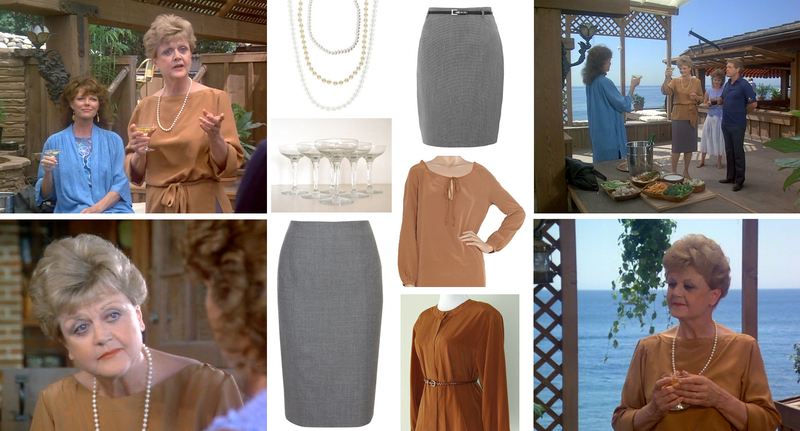 The last images with the tan boatneck top look like she’s having martinis on the roof of Shoreditch House! Thank you very much! And yes, you are right! !